If your favourite sunbathing spot is overlooked by a neighbouring building, or the back garden is easily visible from the front of the house, a fence or wall can be used as a screen against prying eyes. Its position is more important than its size so check your plans from all angles. Sunshine is wonderful, but if your patio is sometimes too hot for comfort create a patch of dappled shade by adding some decorative fencing panels. They will block the glare while still allowing a cooling breeze to waft through. If your garden is exposed to strong winds you might consider putting up walls or fences to protect tender plants. Solid barriers can make the problem worse as the air deflected on one side causes turbulence on the other. The aim of an effective windbreak is only to slow the airflow so choose a fence or wall with plenty of gaps in it. Use walls or fences to separate the vegetable plot from the lawn, or children’s play areas from your flower garden. They can be incorporated into the design of each ‘room’. For example, a low stone wall marking the edge of an ornamental garden can incorporate planters for flowers; a simple picket fence around a play area could be painted in bright colours. Steeply sloping land that is difficult to cultivate can be shaped into more manageable terraces with the help of retaining walls. It can be a big job but the transformation is usually worth the effort. The same idea can be used to add height and interest to a flat garden. A series of natural stone or brick walls can be backfilled with soil to gradually raise the ground level. 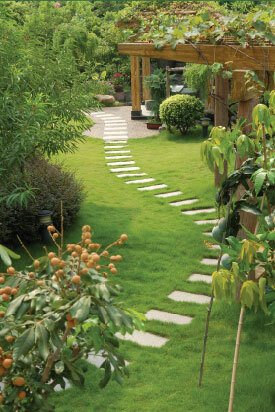 For best results, incorporate internal fences and walls into the overall design of your garden. You don’t have to restrict yourself to rectangular brick walls or brown wooden fences. They can be made in all shapes and sizes and from a wide range of materials to suit any style of garden. They can be curved, angular, undulating, and in any colour you can imagine. Use them to harmonize with their surroundings – or to act as a contrast. A well-built stone wall is a work of art in itself. Instead of hiding it behind plants you could even make it the main feature! If you have some ideas for using walls and fences to enhance your garden but are not sure which materials to use, or you want advice on the best way to tackle the job, contact a professional landscape gardener who will be happy to visit and explain all the options in a free, no obligation consultation.